'There is a God, I have done nothing wrong and surely He will protect me in the end.' This is how Nasser Abdolhosseini, accused of being an MeK member and sentenced to death in Iran's Stalinist show trials comforted his brothers when they came to see him in Evin prison. 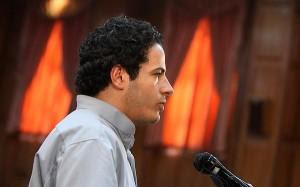 In an interview with Mojtaba Samiinejad, Abdolhosseini's brothers reveal the depths in which the coup administration will go in detaining totally innocent people, making them confess crimes they know nothing about and then sentence them to death just to intimidate the population from taking part in any future protests against the authorities. Nasser Abdolhosseini is seen in this footage here during his trial, looking gaunt and confused, it is as if he is reading his confessions from an autocue, only he does not even know what a cocktail molotov is and calls it a cocktail molophone! Nasser's brothers say he has never been political and has never been arrested before, he is just a working class kid from South Tehran, who makes a living by selling car spare parts. He was arrested on June 26th, without any incriminating evidence. 'Nasser has no computer, he does not even have an email, how was he sending information outside Iran as it is alleged?' Nasser's brothers ask in disbelief. Who knows why God has abandoned the people of Iran for the last thirty years, for He is supposed to work in mysterious ways but where are the human rights organisations who are more than happy to appear in front of Press TV cameras? Organisations like Reprieve and Humans Rights Watch are a disgrace. Their directors and leaders get handouts from the Islamic regime. Why else should they appear on Press TV? It's like the Charity Commission when I wrote to them complaining about Khamenei's office in Maida Vale. They won't do anything because the Islamic regime is brining in millions of pounds worth of revenue in to this country. It's money that has the last say. Free will, my friend. We are all free to do as we choose; we can be bad, or we can be good. Those who choose to be bad and oppress the rest are the ones abusing their free will. God wouldn't be God if God didn't allow us our free will. We have to fight for our freedom when the bad oppress us. It is not the fault of God that Iran has come to this, it is the fault of the bad who have abused their free will and exploited Iran. And if you believe not in God and the above argument, then there was no credible point in blaming God for abandoning Iran and the human rights violations suffered by people world-wide.